Auction for the Promise Club, are very lucky and super excited to be playing in the Olympic Park on the opening day, Saturday 28th July! The leading online music community, Unsigned Band Review (UBR) announced the initiative to give unsigned bands the chance to perform at a specially constructed stage in the Olympic Park as part of London’s 2012 celebrations from 28th July - 11th August. Auction for the Promise Club's track 'Dancer' was recently included in a compilation album that was curated by the Kaiser Chiefs. 'Really epic.. it's massive!' - Peanut Baines from the Kaiser Chiefs about the track Dancer by Auction for the Promise Club. Auction for the Promise Club have a new video for the track 'Liquid' that is set to be released on Friday 20th July on Http://www.auctionforthepromiseclub.co.uk. The band are also recording their second EP this summer which is to be toured this Autumn. More information on news, gigs, releases will be posted on the Facebook page http://www.facebook.com/auctionforthepromiseclubmusic. Auction for the Promise Club are a rock band from St Agnes, Cornwall. They’ve already gained a decent amount of attention including being selected by the Kaiser Chiefs to be the first track on their Emerging Icons Album and making it into the Marie Claire UK Playlist alongside Florence and the Machine and I Blame Coco. Their debut EP ‘One’ was recorded at London’s famed Abbey Road Studio's and Cube Recordings. The band are a PRS for Music 'Taste makers Tip for 2012' and were recently introduced on BBC 6 Music by Tom Robinson, on XFM by John Kennedy and on Absolute Radio by Sarah Champion the female-fronted rock band have garnered critical acclaim for their unique sound, which channels shoegaze through giant hooks and huge choruses. The band is set to play in the Olympic Park on the opening day of London 2012. Previously Auction for the Promise Club have supported Paolo Nutini, Martha Wainright and Pendulum at the Eden Sessions and also The Pigeon Detectives and Reverend and The Makers. 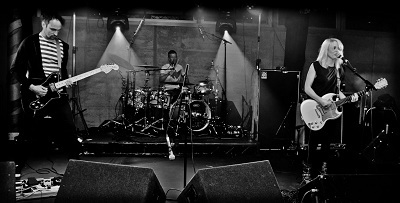 The band has racked up performances at some of the country's most renowned venues, including O2 Academy Islington, Liverpool's Cavern Club, The Factory/Fac251 in Manchester, Birmingham's Gatecrasher and the ICA in London, as well as headlining a closing show at London Fashion Week, Jalouse, Mayfair. The band have recently released a video for the track 'Under China' which was Classic Rock Magazines 'Track of the Day' (available on YouTube), and intimate footage from Abbey Road Studios to the snow clad winter wonderland of Cube Recordings documents the recording of their EP to the song 'If' (also available on YouTube). The Quiksilver brand are supporting the recording of Auction for the Promise Club's debut Album.